LAKE RETBA, SENEGAL – UNDATED: Aerial photograph of salt-collecting boats on Lake Retba, Senegal. 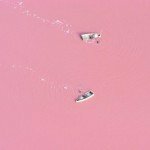 A BOAT floats on what looks like a huge strawberry milk-lake. The wooden vessels were photographed from the air bobbing on Lake Retba, in Senegal, west Africa. From above the mass of water – which spans one square mile – looks a creamy pink colour. And just like the Dead Sea, swimmers can float on the water with ease. 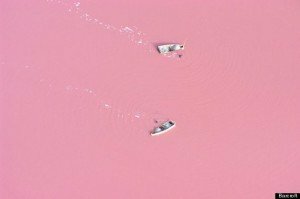 The bizarre colour is caused by high levels of salt – with some areas containing up to 40 per cent salt content.